Ideal holiday property with manageable garden on the outskirts of a pretty village! 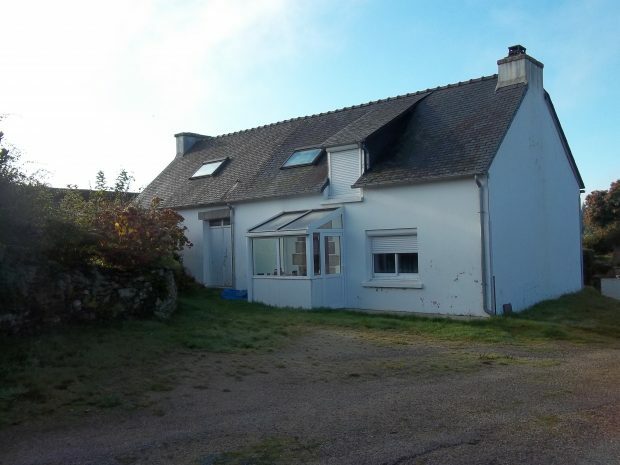 This property is perfect for a holiday home in Brittany and it’s in the Regional Park. The house is in a good condition, good structure and ready to move in. It will need some new decorative work but nothing major. On the ground floor: the entrance is through a little porch which gives access to the main room with a corner fitted kitchen that is very functional, it is an open room; further, the dining area and the lounge space around the fireplace and wood burner, tiled floor, a large window brings a nice brightness into the room. In the back is a utility/storage room with a door opening into the garden, and a bathroom with shower and WC. The master bedroom is above with an extra large velux windows and a dressing area. From the main room, a staircase leads to the first floor where you will find two double bedrooms with windows and velux (there are also wood panels on the walls), and a smaller bedroom between. Electric radiators for heating. Double glazed windows throughout and connected to the mains sewage. There is a little garden that’s very easy to maintain and a garden shed. Parking is easy in front of the house. Walking distance to the centre of the village which offers a minimum of shops! Don’t miss it, this is a very good opportunity!